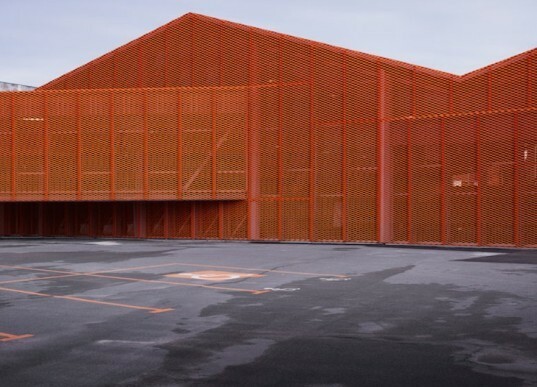 Bang Architects has successfully converted a dilapidated, vandalized former peanut factory into an awesome skatepark wrapped in bright orange mesh. 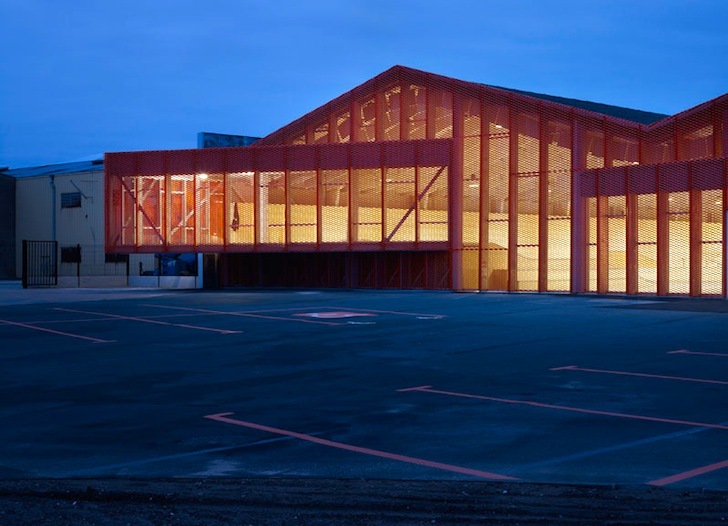 Called ZAP’ ADOS, this new gathering space gives youth who live in and around Calais, France's somewhat bleak urban landscape something to be excited about without generating a heavy carbon footprint. Originally constructed out of precast concrete panels that permitted not one ounce of light, the park is now flooded with daylight and finished off with natural materials. Bang Architects writes that ZAP’ ADOS was built along a canal in St. Pierre and extends an urban renewal program initially sparked by La Cité de la Dentelle. Making the project visible was of utmost importance in order to spruce up the place a bit, hence the bright orange mesh and gables. But the mesh plays another role. By knocking out two concrete walls and replacing them with glazing that is then screened in by the orange skin, Bang lets in natural light that completely livens up the interior and also prevents graffiti artists from getting too excited with the exterior. The ceiling is made of melanin baffles, and the skate joinery has been constructed with Finnish Birch plywood. A long passageway and the mesh envelope ensure that spectators can be a part of what’s happening inside without getting in the way. This is such a fantastic example of adaptive reuse and urban renewal – especially since it comes with such a positive and colorful ethos that is bound to give city youth just the boost they need. I was not aware that peanuts were made in a factory. This is a fantastic example of adaptive reuse and urban renewal. We love it!